November 19, 2015 by Emily Brees Leave a Comment - This post may contain affiliate links. Last week I attended a pie baking class. It’s easy to get in a festive holiday spirit when you’re baking and I enjoyed learning a few new tips and tricks just in time for Thanksgiving! Plus I got to take home this entire Pumpkin Pie + All Butter Pie Crust! I promptly enjoyed a BIG wedge! We had two options: apple crumb or pumpkin. I chose the pumpkin and sprinkled the top with a light coating of the crumb topping to give it a little something different. It melted into a thin sugar crust over the pumpkin and smelled so delicious. I tried to resist cutting into it when I got home but I couldn’t. I cut a small sliver, then another and it was then I realized the immediacy of my situation. This pie needed to vacate my premises before I did any additional damage (i.e. eat the whole thing). To the pleasure of my coworkers the pie landed in the break room and the recipe right here on Oat&Sesame! Happy Thanksgiving! In a food processor, pulse the flour, sugar and salt until combined. Add in all of the butter and pulse slowly until the mixture has pea sized lumps and resembles coarse crumbs. (this can also be done by hand with a pastry blender or fork if you do not have a food processor). Slowly drizzle 1/2 cup ice water to start, adding 1 tablespoon of water at a time until the dough just comes together. It doesn't take much for it to come together. Divide the dough in half and form it into two disks. Wrap in plastic wrap and let chill overnight. Tip #1: Premix the dry good and keep them cold in an airtight container in the fridge until ready to use. This would be a great step for early prep for a holiday gathering or party. Add both sugars, salt, and spices. Mix to combine. Whisk in pumpkin puree and the cream. Keep mixing until everything is combined and is uniform in color. Roll out your pie dough so that it overhangs your pie dish by 3 inches on each side. Once you have your crust in place, fold under any excess dough. (Trim any dough edge that has too much to fold under). Crimp the edges by using the tines of a fork or flute the edges by pinching it between your knuckles (video here). Pour the filling into an uncooked pie shell. Glaze the edges of the shell with the egg wash and sprinkle edges with sugar, if desired. Sprinkle a bit of crumb topping if you want to create the pie I made! Bake for 45-50 min until the filling is no longer jiggling. The center should still jiggle slightly as it will finish cooking and firm up as it sits. Check the crust about halfway through baking and if it's browning too much, put foil strips around the edges to prevent burning. Remove the pie from the oven and cool on a rack. Cool the pumpkin pie for 2 hours before serving. In a large bowl, whisk the sugars, spices, salt and flour. Switch to a rubber spatula and slowly mix in the melted butter. Stir to combine and then use your hands to squeeze the mixture into crumbs. This can be made up to 1 week ahead of time, but should always be used at room temp. Store in refrigerator. makes enough to top 1 pie. I used just a light coating across the top of my pie. Not only is the topping sweet, but too much crumble will just sink into the pumpkin filling. You should just coat the top lightly. Tip #! : The best flavor will come from freshly grated cinnamon and freshly grated nutmeg. Tip #2: Always add your spices and mix into the sugar before adding in the cream to ensure even distribution throughout the filling. 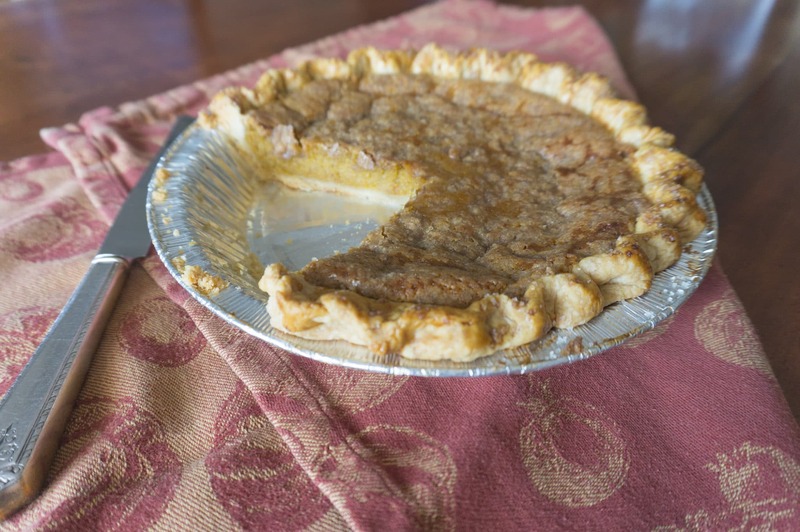 Tip #3: Since pumpkin pie is a custard, leaving it in the oven too long will cause the eggs to overcook, tightening the proteins and causing the pie to crack in the center. 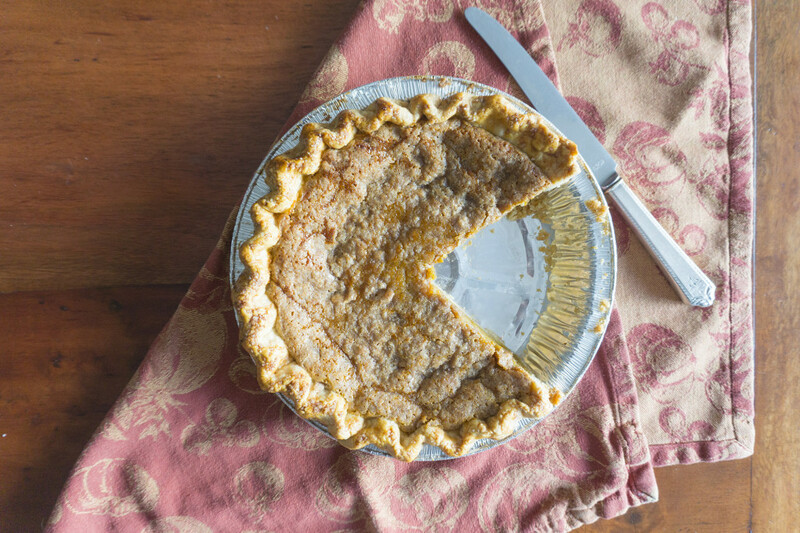 Take the pie out when the pie is set but the center is just a little wobbly still! 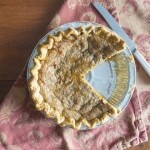 Need more Thanksgiving recipes – check these out too!